​a K-6 public school in Norwich, VT. 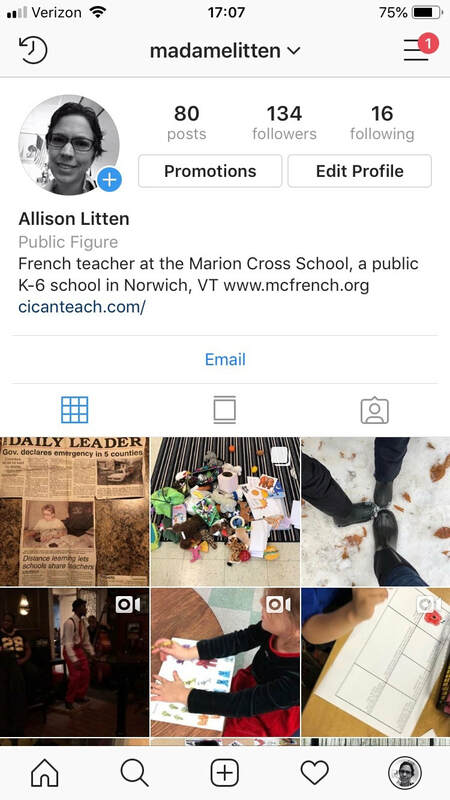 Welcome to the site for the French program at the Marion Cross School in Norwich, VT.
All classes in our school, from kindergarten to sixth grade, have French classes multiple times a week. ​Please do not hesitate to contact Madame Allison Litten or Madame Minda Moskowitz with any questions. Rep en français was a huge success! Thanks to everyone who participated. Click on individual class pages above to see (and maybe hear!) what each grade performed. I am honored to be this year's VFLA Teacher of the Year. In a state with so many incredible language teachers, with many of whom I have worked and collaborated for years, it was with pride and privilege that I accepted this award at the annual VFLA conference in Quechee last week. Both my colleague and friend Tom Harkins, the Spanish teacher at the Lyme School, and Mr. Bill spoke at the conference, and their attendance made it an even more special day. I came back to school the next day to a wonderful "congratulations" poster from the sixth grade. I am excited to represent Vermont at the Northeast Conference on Teaching Foreign Languages (NECTFL) in February 2020, at which I will also present a workshop on one of my favorite teaching activities: Movie Talk. Interested in what students can do at different stages in their language learning? ​Here are some simplified explanations of the novice and intermediate ACTFL proficiency levels. MCS students continue to show their linguistic prowess! The following 6th graders scored high enough on the Grand Concours national French contest to advance to the second round, the speaking portion! ​Congratulations are in order to the following students. Marion Cross swept the elementary division of the annual VFLA poster contest. Bien fait!! Qu'est-ce qu'on fait en classe?! Here are photos of some of the activities we have done this year across the grades. You can also visit the MCS Instagram page at @madamelitten to see more photos! You can also find Madame Litten on other social media platforms. Want to know how studying a second language can benefit children in other academic areas? Here is a compilation of studies and their findings, outlining second language study and its positive impact on all aspects of learning. Vermont ranks second in the number of PC volunteers per capita for the second year in a row. Learning a second language is beneficial for that experience! NNELL, the National Network for Early Language Learning, has compiled a list of some excellent resources for parents of early language learners. Check out their list here to see examples of apps and websites as well as general information for parents. Language Learning in the News-UPDATED DECEMBER 2018!! Practice our vocabulary with Linguascope! See Madame Litten for login information.